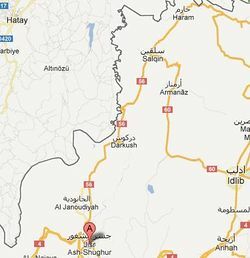 Jisr Al-Shughour (also Jisr ash-Shugur, Arabic جسر الشغور) is a town of around forty thousand residents in Idlib province, around twelve miles from the Turkish border. It's known for its conservative Sunni population with strong Muslim Brotherhood presence and has been the place of a massacre in 1980 in the same uprising that the famous Hama massacre was part of, when residents set the Ba'ath party headquarter on fire. In early June 2011, when atrocities of that scale weren't already common in the current crisis, another massacre happened. 120 security members and an unknown number of civilians lost their life. In the aftermath, most of the residents fled the town, some to Aleppo and other near towns, but several thousand across the Turkish border which caused the first wave of refugees and the first camps to be set up for them in the neighboring country, at a time when the total number of dead in the crisis was estimated at around 1000 people. The number of security personal killed is generally agreed on by all commentators, only the reasons differ. 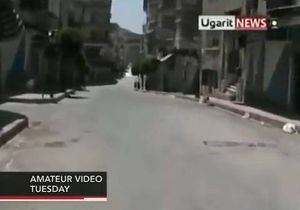 According to official government sources, terrorist groups overrun the town using government cars and wearing military uniforms, filmed themselves while causing general havoc and setting up several ambushes. According to opposition sources, a mutiny happened and some of the victims were defectors shot by their collegues because they refused to shoot at peaceful protesters, while others were killed by an angry mob in retaliation for their attacks on civilians. 6 The point of no return? 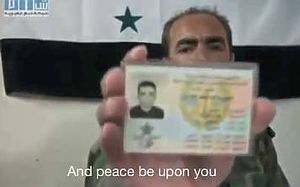 “I’m going to tell you what happened, even at the cost of damaging the cause of the revolution,” says Uthman, a refugee from Atma, who had to flee to the Turkish refugee camp of Reyhanli after the battle in Jisr Al-Shughour. According to Uthman, in Jisr as-Shughour everything started around 20 May 2011, when 15 Syrian workers were killed by state security forces. People were already prepared to respond to the attacks with force. In Omar’s account, the armed protests started right after this massacre. “On the third of June, we took weapons with us and hid them, while marching in the demonstration,” he recalls, “when the snipers of the military security (al-mukhabarat al-askariyyah) opened fire on us from the post office, we hit back—killing some of them”. Ammar Talib Moaz, an alleged terrorist "confessing" to SyrianTV, visually not older than 20, mentions that on Friday the 3rd they heard about the killing of Basel al-Masri, and members of leading families of which al-Masri was part of went to his funeral, bringing arms. After that, they went to the post office and "committed a massacre" there. 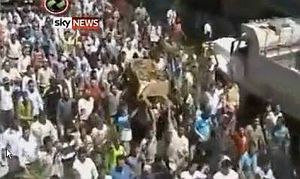 While Ammar doesn't mention a demonstration, the funeral is mentioned and shown - without naming the deceased - in a Sky News report. The same report shows an undated scene with people running from a group in the background which seems to wear uniforms, but is on the street and not on the roof of a post office. Shots heard but no casualties seen. On the next morning around 8am, Ammar Talib Moaz reports, the leading families ordered him to come to a district called Al-Sameaa where he and the others were equipped with guns and ammunition. They then headed to the Military Security Post where a crowd of 800 people came together. With 25 bullets each and parted in several groups around the area, the post was taken under fire until noon, when a truck full of primitive explosives arrived and broke through the fence. They helped explode the load by firing on it and finally the security personal inside came out and surrendered, but were all shot. The crowd entered the building and killed the remaining inhabitants, with Ammar and his friend filming. “The siege of the post office lasted for 3 hours,” remembers Tareq Abdul-Haqq, a 26-year-old activist from Jisr As-Shughur, while showing me the videos he filmed during the clashes. “We tried everything: dynamite barrels used in construction, exploding a gas cylinder . . . in the end the last surviving officers came out because the noise of these explosions drove them crazy.” The wider confrontation with military security forces lasted for two days, causing the government in Damascus to deploy a reserve security contingent to the restive city on 5 June 2011. Unexpectedly, the insurgents succeeded in resisting the offensive with Kalashnikovs seized from the security headquarters, and the contingent had to retreat. “After having defeated military security, we set up checkpoints and planted landmines [in preparation] to face the arrival of the army,” says Omar. The original rebel-supported explanation for the high number of dead security personnel - if admitted at all - was that a mutiny happened inside the forces, as parts of them refused to follow orders to shoot on the peaceful, unarmed protesters. 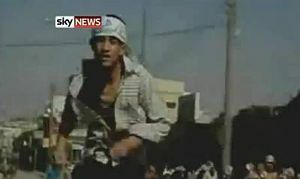 Pseudonymous activist "Mohammed Fazo" told the BBC that snipers shot at the Friday funeral from the post office (and up to two other rooftops according to what wounded "Ahmad" told AP according to Al-Jazeera), killing many of the 15000 attendees "as if they were firing at a herd of sheep. Actually, they might have had more mercy on the sheep", as "Abu Abdulla" put it to the BBC. When the people reacted to the bloodbath and surrounded the security post, the people inside called in the army for support. Mohammed Fazo says that when the soldiers arrived, many refused to open fire when they realised the protesters were unarmed. "When the army did not fire at us, the security services fired at the army personnel who refused to shoot at us. And then the army responded by firing at the security personnel who were firing on their own colleagues and shot them dead." Early on Tuesday, another account from a resident reached by BBC Arabic: "There are army soldiers who gave themselves up to the civilians, they joined the civilians and the army killed them. I swear to God, that we are all civilians... there are no terrorists in Jisr al-Shughour." Other media carried similar reports. At least one video testimony shows a man reporting how the snipers shot at civilians, which caused army personal to change sides refusing to follow orders, ending up being shot at themselves. The protesters were then joined by the battalion led by Lieutenant Colonel Hussein Al-Harmoush, the first high-ranking officer to defect, and planned an offensive against military security forces, which were the only intelligence branch that refused to hand over its weapons. A reporter for Time Magazine tracked the colonel down in a village near the Turkish border. According to the article, Lt Col Harmoush said he and his men had been sent to Jisr al-Shughour to restore order. When the army began shelling the town, he said, he decided to defect. He claimed to have taken 30 of his men with him. ... when the BBC finally tracked the colonel down on the phone, he told a story that was rather different from the myth that was already writing itself into the history books. His defection, he said, had actually taken place four days after the killings in Jisr al-Shughour, on 9 June. Furthermore, he said he had defected on his own, and only joined up with a number of other defectors in the town later. "I was not there at that time. I arrived there on 9 June, and when I arrived, there was absolutely no Syrian army there." Furthermore, he said, none of the other defectors he joined had been present at the time of the alleged massacre. He admitted he had invented much of his initial story purely to keep the Syrian army at bay. On September 16, 2011, AFP announced that Syrian TV reported Harmoush's "return". In an interview broadcasted by Syrian TV, the Lt Col tells a third story. As he now says - as far as making sense of the confusing English summary goes -, he failed a security course in the Army in 2010 and defected later, months before the video. He then fled to Turkey "because of the violence", adding that he thinks armed groups were responsible and he never received killing orders while he was serving, contrary to what he says in the defection video. After arrival in Turkey, he received initial support of $US1000 and a used laptop. He was then contacted by several people of the Muslim Brotherhood, the FSA and by Sheikh Adnan Al-Aroor, to all of whom he delivered intel about army strength and other details, while going back and forth between Turkey and Syria. He was promised support on several occasions but promises weren't met. While he says that the defection video was made in a district of Jisr Al-Shugour, his involvement with the actual events seems to be minor if not non-existant. He received SYP 50,000 for the video while the person who made it received SYP 2 Million. While it is unclear how Harmoush ended up doing this interview and there might have been pressure involved, his statement to the BBC already admitting fraud indicates that he certainly wasn't the hero and leader of the protectors of the people early media reports following his defection video made him to be. In January 2015 Önder Sığırcıkoğlu, an ex-Senior MIT (Turkish intelligence) official made statements to the Turkish press about Turkey's role in training and arming the "rebels" in the early stages of the crisis. He claims that it was him who handed Harmoush back to Syrian authorities because his conscience didn't allow him to let the "killer of 138 people" escape justice. After an investigation by Turkish authorities he and seven others were arrested and tried. Sığırcıkoğlu was handed a 20 years prison term but was able to escape after 32 months while being transported from one prison to another. On February 1, 2015, it was alleged that one of the leaked "Caesar" photos showed Lt. Col. Harmoush died "under torture" in prison. This was reported by Lebanese daily Zaman al-Wasl (English version - Arabic version with working image) The visual match, however, is rather dubious. This report also mentions competing claims Harmoush was killed by firing squad in early 2012, and that he remained alive at the end of 2013, well after the last "Caesar" photo should have been taken in August. By this report, he was innocent of anything but statements of dissent, and became imprisoned after he was "kidnapped by Syrian regime in September 2011, from a refugee camp on the Turkish border," a claim Mr. Sığırcıkoğlu would obviously contest. According to official Syrian sources, not only were the locals during the days armed and violent, but there were also foreigners involved who engaged in some unusual action sniping/posing in uniforms/causing general havoc. Martin Chulov sniffs the Iranian connection. An indication that there might be some truth to that comes from none other than Martin Chulov, chief correspondent for all things Syria of the British Guardian newspaper and featured in many articles of this wiki as bringing what "activists say" to the western readers attention. 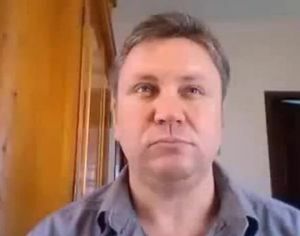 Then reporting from the Turkish border region, he gave two Skype interviews about the events, on the 9th and 10th. In the first, he cites two alleged sources for the mutiny described above, while in the second he makes some interesting remarks about outside forces being involved. Chulov informs us that "all" the refugees they were able to interview during the last two days, in camps and in hospitals, reported to have seen "fully bearded men" wearing black being present during the events on Saturday. To make it even more unusual (as Chulov knows and points out Syrian security personnel rarely wears full beards), those people did not speak Arabic. Which kind of excuses him for not drawing the obvious conclusion that those were "Shabiha" - in addition to the fact that this term was not yet introduced to the global media at that point - but stating that, still reporting from the Turkish border region, the clear implications must be that those people were Iranians. For some reason this potential scoop is missing from his written reports about the events. At least one fatality listed by the pro-opposition Center for Documentation of Violations in Syria may a horrible picture: Mahmoud Rajab Saeb, local civilian man field executed June 5, it says - a bit later for the timeline as we understand it. It appears had his teeth smashed out, and probably later had his left eye area either blown out or cut out. The date can't be right anyway: the picture is in a Youtube video uploaded on June 2, PST, a bit earlier than most events considered. At some point, a second mass grave was discovered, with information unclear. A second-hand source passes on a Press TV report dated June 15 (but no longer available, if it ever was). This says "the second mass grave found in Jisr al-Shughour within days" and held "the bodies of at least 70 Syrian security forces. The number may be erroneous, but the second site was apparently exhumed on the 15th. A photo by LOUAI BESHARA/AFP/Getty Images is captioned "Syrian security forces stand guard as a medic carries a body found at a mass grave in Jisr al-Shughur ... on June 15, 2011. ... The bodies were retrieved from under a pile of garbage." A third site as well was found by the 20th when Press TV reported a third mass grave uncovered. Syrian authorities say the grave contains the bodies of at least 29 soldiers which are decomposed and decapitated and bear marks of torture. 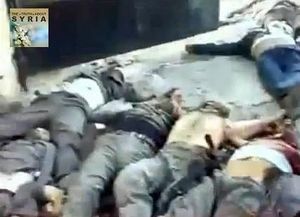 Damascus says the soldiers were killed by armed gangs. Syria's foreign ministry invited journalists and ambassadors from some 30 countries to see the burial site. The delegation was later taken to the local security forces headquarters where the authorities say 82 policemen were killed by armed men on June 6, AFP reported. No direct comment on this visit by Ford can be easily found. But an AP photographer shows him with a mask and what might be read as a horrified look on his face. 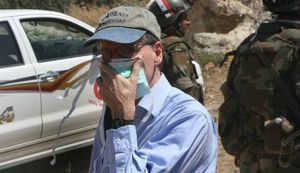 Caption: "Ambassador Robert Ford, the U.S. diplomatic representative to Syria, covers his nose from the smell of dead bodies during a government-organized tour to a mass grave with other foreign diplomats in Jisr al-Shughour, Syria, June 20, 2011. / AP Photo"  He was criticized for taking part in this "sanitized trip to the country's restive north that President Bashar Assad's regime used to attempt to justify its military crackdown," but the State Dept. defended it as letting Ford "see for himself the results of the Syrian government's brutality." For the moment for reference and basis for further research follows the whole SANA article as the site is difficult to reach at the moment (photos showing killed security members, no particular significance). JISR AL-SHUGHOUR, IDLEB, (SANA) - The Syrian TV broadcast photos of the brutal massacres perpetrated by organized armed terrorist groups against the civilians and the army, police and security forces groups in Jisr al-Shughour in the province of Idleb. Members of the terrorist groups used government cars and military uniform to commit their crimes of killing, terrifying people and sabotaging. They filmed themselves committing vandalism acts to manipulate the photos and videos and distort the reputation of the army. The terrorists attacked police and security centers as well as other governmental and private institutions, violated the streets, neighborhoods and houses and used rooftops to sniper and shoot at citizens and security forces. The criminal groups didn't stop there. They also set up ambushes for police and security forces, mutilated the bodies of some martyrs and threw the bodies of others into the Orontes River, in addition to putting barriers on the roads and terrifying people. The groups members also kidnapped a number of the martyrs' bodies and buried them in the ground to later promote them as if they are mass graves with the help of the channels they are working with in inciting against Syria. The citizens in Jisr al-Shughour called for the help of the army and security forces to enter the city and protect them and their children against the crimes of those terrorist groups and punish them severely. The number of the martyrs of police and security members exceeded 120 until Monday evening, who were killed at the hands of the armed terrorist groups in Jisr al-Shughour. The injured members of the security forces who were attacked on Monday by armed terrorist groups in Jisr al-Shughour narrated the details of the attack. One of the wounded security members, Murad Qadour, said "At ten o'clock and a half we were subjected to a surprise attack by armed terrorist groups and I was shot in my right foot, then I was hospitalized to Idleb Hospital at seven pm…Later, I was moved to Aleppo Hospital and my health condition is stable now…I stress that I will sacrifice my soul for the sake of my motherland and its leader." Another injured security member, Ahmad Ali, said "We moved to support our colleagues in Jisr al-Shughour as they were surrounded by armed terrorists…We passed through a road between the mountains where we were ambushed by armed groups and they opened fire on us." Ali added "A number of the security members were martyred by the fire of the gunmen who were using various types of weapons such as the snipers, machineguns and rifles," indicating that a number of the bodies were mutilated. An injured security member, Hassan Dalou, said "We were ambushed by terrorist groups on the road between the mountains while we were in the way to support our colleagues who were cordoned off by armed terrorist groups in Jisr al-Shoghour and they opened fire on us." Dalou affirmed that a huge number of the security members were injured and martyred, denying the news broadcast by the channels of instigation and sedition. He indicated that the citizens of the area know the truth and they know that what the instigation channels broadcast are lies and fabrications as the task of the security forces is to protect the citizens from the armed groups. Injured security member, Ja'afar Taher Mahmoud, said "The armed groups displaced some of citizens from their houses to booby-trap them and to prepare an ambush," indicating that he and his colleagues thought that those who were in the houses and farms were peasants and they were surprised as they opened fire on them from four directions. For their part, a number of Idleb citizens stressed that the members of the army and security forces are their brothers and those who attack them are conspiring against Syria, condemning the massacres perpetrated by the armed terrorist groups in Jisr al-Shoghour as 120 members of the military, security and police forces were martyred. Citizen, Abu Mohammad, said that the terrorist groups mutilated the bodies of the martyrs and buried a huge number of them behind the security detachment as they killed them to say later that they found a mass grave and to convey this news to the biased satellite channels which instigate against Syria. This page was last edited on 4 December 2015, at 05:19.